Round Transvectors are ideal for conveying any material that can be moved in an airflow and for removing fumes and scrap. Air Flow Amplifiers deliver a large airflow for conveying, drying, cooling or ventilation. These high flow, bladeless blowers have no moving parts so they are inherently safe. They amplify compressed air volumes by 12 – 20 fold in ducted applications and up to 60 fold in unducted applications. They are especially useful for removing metal chips and scrap, ventilating fumes or smoke, and conveying small parts, pellets, powders and dust. As a vacuum or blow-off device, air amplifiers are more compact and less expensive than variable-speed blowers and fans, provide instant on/off performance, and operate at low noise levels to meet OSHA requirements. Air Flow Amplifiers are easily mounted and can be used in both ducted and unducted applications. 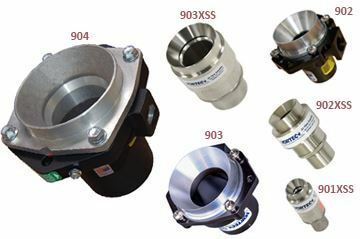 They are available in several sizes, both aluminum and stainless steel and deliver flow rates from 32 to 2300 SCFM (900 to 65,000 SLPM). Compressed air consumption through the Transvector is proportional to the absolute inlet pressure. Therefore, the compressed air consumed at 50 PSIG (3.4 Bar) or 65 PSIG (4.5 Bar) is half of that consumed at 115 PSIG (7.9 Bar) or 130 PSIG (9.0 Bar). By controlling the inlet pressure, it is possible to vary output flow over a wide range-duplicating the functions of complex variable-pitch and variable-speed fan systems. Transvectors have no moving parts and do not require complex controls. In automated systems, the pressure regulator can be pilot operated and controlled from a remote location. Since airflow requirements of an application are usually not known, we recommend the use of a pressure regulator. This will ensure that the Transvector is set to only consume the required amount of compressed air. For Transvectors to operate properly, they must be kept clean. Condensation in compressed air lines creates rust and dirt. Use a 5-micron filter separator to remove foreign material from the lines. Failure to use a filter will cause clogging in a matter of minutes. Transvectors have no moving parts. If the air is properly filtered and the filter elements are regularly changed, no maintenance should be required. Change the filter elements and inspect the inside of the Transvector about every six months for dirt, wear and contamination. Remove the four screws that secure the suction inlet to the body and carefully lift out the aluminum shim and inspect it and the nozzle area for accumulated dirt. If dirt is observed, increase filter changing frequency. Any restriction placed in the outlet or at the suction inlet of a Transvector will reduce its performance. Transvectors will work against small dusting back pressures at either end. They are designed to anticipate some back pressure-up to 2" (5.1 mm) of water column. In many applications, the outlet of a Transvector will be connected to ducting to carry smoke or fumes away. Design ducting for total flow resistances of less than 2" (5.1 mm) water column. This will prevent major reductions in flow performance. When venting a large tank or other closed space where workers are involved, consider the nature of the fumes to be removed. Whether they are heavier or lighter than air will determine how the Transvector should be used. The following suggestions are for a large tank with a hatch at the top. For heavier than air fumes use the suction feature of the Transvector. Place it low in the tank in a remote corner. Attach a flexible exhaust tube to the Transvector outlet and run it out of the hatch. As fumes are vented, fresh air will flow in the hatch. For lighter than air fumes, place the Transvector outside the tank near the hatch. Attach flexible tubing to the Transvector outlet and run it down into a remote corner. As the Transvector pumps fresh air into the tank, the lighter fumes will be forced out the hatch. Transvectors are ideal for conveying light parts with air. Most materials such as sawdust, grain, plastic parts and resins, soap flakes and so on work well in Transvector conveying systems. The material should be dry, light and finely divided. Material flowing in a tube will slow because of loss of velocity in the tube. This is especially true in blow conveying where the material is sucked into the Transvector and blown out into a tube connected to its outlet. As the conveyed material slows down, it can bunch together causing pressure drops and blockage. Use blow conveying on short runs. Vacuum conveying is preferred on long runs. In vacuum conveying, the material is drawn into the remote end of the tube and moves toward the Transvector. Air in the tube moves faster as it approaches the Transvector, preventing blocking and bunching. Another important consideration is static electricity. Conveying applications can build large static charges causing sparks and a possible fire. Use grounded metal piping to eliminate charge build-up when flammable materials are nearby. Since large volumes of air are used in Transvector air conveying, the material arrives at the end of the run in a rush of air. Care must be taken to separate the material from the air. If the stream is injected tangentially into a cylindrical receptacle, it can be settled out in a quiet zone at the bottom of the container. The container must be vented. A common use for Transvector Airflow Amplifiers is smoke and fume removal from welding operations and solvent tanks. Because of the unusually quiet operation of the Transvector; it can be placed near workers. Its output can be ducted through flexible tubing to a window or an existing exhaust duct over 50' (15m) away. Always use a filter and pressure regulator. Start with a very low pressure, about 5 PSIG (0.34 Bar), and run the process. Increase pressure slowly until all of the smoke or fumes are removed. Lock the regulator knob at this point. Transvectors can be used to cool hot parts when they are located in a relatively cool area. The Transvector's capacity to cool the parts is directly related to the total airflow directed at the part and the difference between the room and part temperatures. Transvectors do not contaminate parts with coolant.